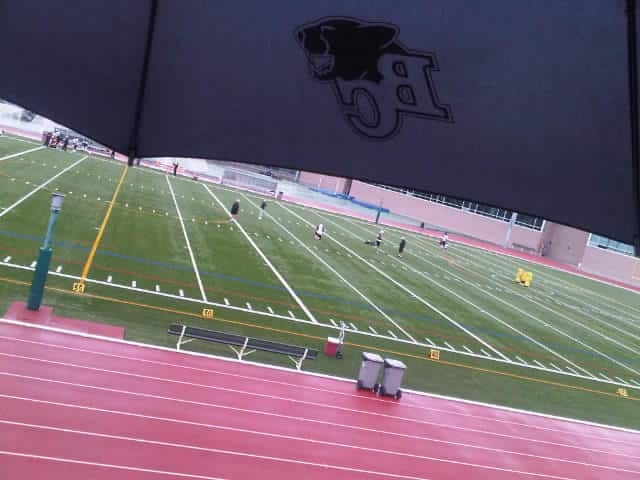 Its been a drizzly wet day in Kamloops and the Lions decided that one practice would be the order of the day. So, we got to sleep in and go for breakfast this morning while the players were in meetings and did film work. We’re back for the afternoon and will likely see some more rain here before the session is out. Our updates will begin shortly, following the players warmups, around 4:30pm. 4:22pm: Offense is working on some undefended passing routes with a scout team. Likely running through plays to be used Sunday in Regina. 4:45pm: Both sides of the ball continuing to walk through plays. Assuming/hoping eventually we’ll see some scrimmage action. 4:48pm: O’Neil Wilson is quietly having a nice camp. There are some good receivers here. Reed, Washington, Black have all had their moments. Some scrimmage coming up! 4:58pm: Black in for Paris Jackson who is sitting out this session again (precautionary) Team is working on short yardage offense. Black promptly drops a pass in the endzone that should have been caught. 5:00pm: Lyle Green can’t handle a short dump pass. Slippery ball, poor throws and drops are dominating this session. Sloppy. 5:01pm: Problem solved. Throw the ball to Arceneaux. Touchdown. 5:07pm: Printers and the first team O-line getting in some running plays. All the RB’s getting touches. Messam has a strong run bouncing it to the outside. Big fullback with decent speed. 5:13pm: Messam absolutely undresses LaRose with a beautiful stutter step in the open field. 5:15pm: Some concern for Pittman as he gets up slowly attended to by the trainer after a run stop. Pittman missed a couple sessions already with a concussion. This looks an arm or shoulder issue. 5:23pm: Not sure what to make of the lack of work for Jamal Lee so far. Harris on the other hand is getting a lot of work. Perhaps an indication of the lineup for Sunday. Lee is also at fullback. 5:37pm: Team is working on the punt coverage and now moves on for some field goal work. Kicking from the 38 yard line. Both Whyte and McCallum look good. 5:54pm: Team is conducting a brief scrimmage. 6:00pm Its only my uninformed opinion, but I’m guessing by the way Jarious Jackson has been throwing the ball this week, his shoulder is still giving him some discomfort. Derrick Armstrong drops another pass. He has not impressed this week, several rookies look better. 6:03pm: Book it: Your starting running back is Jamal Robertson. 6:06pm: some concern about the backup QB’s. None have looked sharp. If these drills were “live” we may have a couple injured as well. Standouts today: Jamal Robertson, James Yurichuk, Harris. Sitting out: Bolden, McKenzie, Jackson, R. Jones, Elimimian.